Thanks for letting me know about that Mahlua, I'll give it a shot next upload! Ok so just bought Clip Studio, and I love it. I used it to clean up all the movement/expression studies I just did and I've finally finished with this little exercise. I used references for these 2 dances, refer to previous posts to see what I referenced. This last one however, to test myself I did it without a reference and I think it turned out good! it's settled. time for you to stop training and going for real work buddy,draw you own manga!!!! Second this, these studies look good. The poses are nice and drawn out well. I'd say sometimes your lines look a bit off, which is sort of a thing with digital sometimes, but the actual drawings are good. As seen from all the expressions. The one without reference looks good, I'd say you're ready to try some full on stuff as well! It'd look cool. ARGH COLORING IS HARD, HOW DO I TEXTURE? WHY AM I BAD AT THIS? Sorry for the caps... I definitely need some advice on how to color. This is probably my like 3rd or so attempt at this, I don't think it looks BAD but it doesn't feel like I'm doing it "right"
Anyway, it is incomplete so far but I'm actually writing my story and setting things up right now, this is one of the characters. Her title is Hotaru, haven't named her yet. Also this drawing is incomplete, I need to take a break ._. Thanks for the encouraging words Shane. @Manimal, You are absolutely right about my lines, I've just been manually cleaning them up as I go but I often miss stuff and it starts getting tedious doing it so I just leave it. Is there anyway to make this process easier or do I have to just buckle down and go through each drawing with a fine comb to fix those messy lines? I don't really get why people here on MR dislike colouring . In fact, I love to colour and find it helpful to relax. ATM, I can't really give advice as I don't know what your target goal is for colour, both minor and major. Once I know what you aims and style are, then I can offer my advice. Hey hey welcome, and very nice studies! I actually prefer the sketches tbh, as I do often. Just like the lively lines, that often get lost with inking (in my pics also). I do see the problem with the feet you got, but I think that was discussed earlier - if I can help you, just tell me I'm still struggling with them myself, but might be a bit further in understanding and be able to give some useful advice. Your anatomic understanding and feel for dynamic movement is fabulous! Makes me wanna look into some details, hope you don't mind pointing some minor issues out. On your coloured character T_T I'm so sorry. Maybe it helps for the next drawing. The left stance has a beautiful tension to the torso, which I really like. But while the torso is looking left, the legs are frontal. Als the knee that is in the back needs to be a bit highter due to perspective. You can actually stand like this, but it would be very uncomfortable because you would twist the hips to the front - maybe like this it would be a bit more natural. Also, hands look good on adult characters if they are roughly the size of the face (not the head!) So a fist is about half the face. The right stance is quite contrary to the left one, it looks very formal. If you wanted some dynamic like in the left one, you could try moving the left leg a bit back; if it's what you wanted to express that the character has two sides, it's good like it is. If you correct the feet a bit, the lower legs would move a bit to the back to adjust the feet going more to the front. Thank you so much for the advice Gabryel, I think you nailed the issues spot on. I've corrected them and the picture "feels" much better. I'm using Clip Studio Paint for drawing and coloring right now. Coloring is still rough for me, it's just so tedious and I can never get it to look anything better than amateur ._. Perfect! And so glad I could help :3 Always happy to do so, plus I learn something myself every time I explain anything. 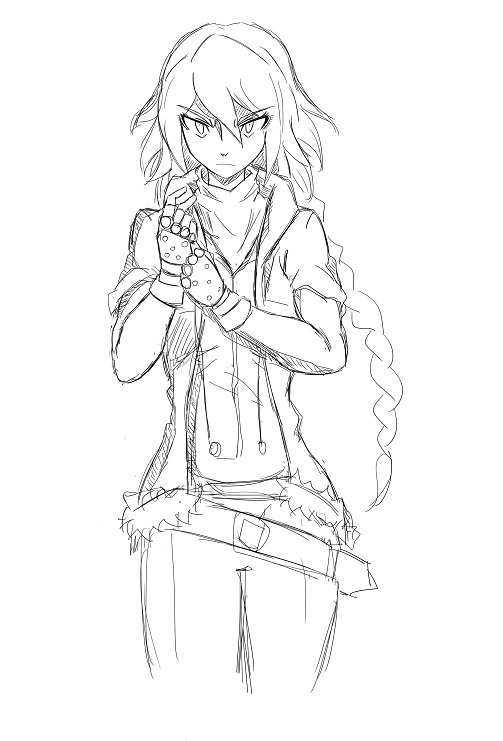 Whew, taking a break from bashing my head at coloring and decided to resketch one of my earlier characters. Looking forward to finishing this one! Such nice sharp lines! Awesome stuff Devola! The Road of the Sun! The working title for a small game I am programming, doing art for and possibly attempting music for. The game is an RPG in the same style as the Etrian Odyssey games but inspired more by Banner Saga and The Oregon Trail. Its meant to be a shorter experience telling a more personal story. I will be releasing a story synopsis and prototype as I get closer to finishing the project. For now, I will introduce the characters. The game will feature 8 Main Playable characters and a 9th character who's appearance and design are determined by the player's actions. 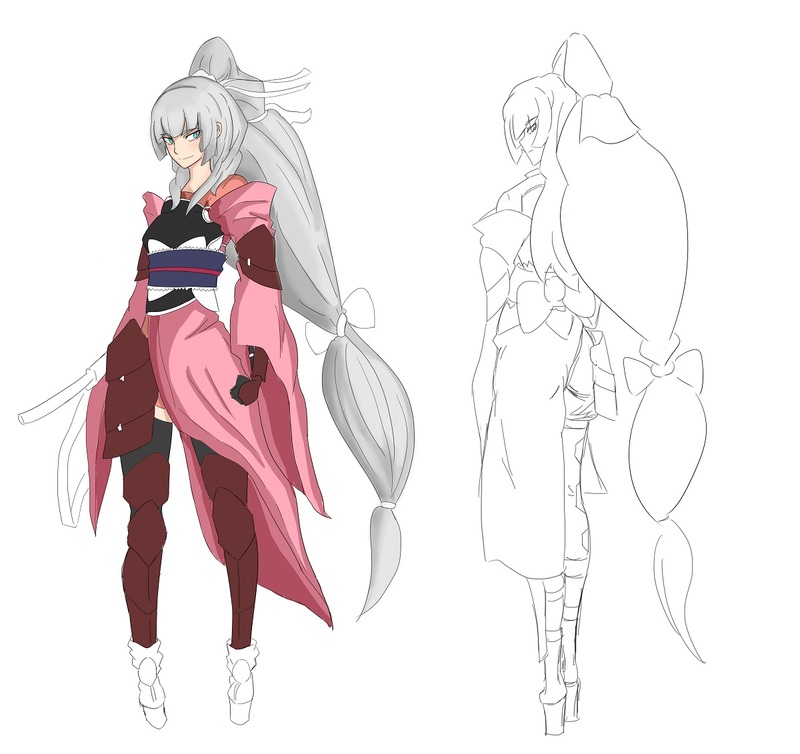 For now I will be introducing the 4 main female characters, followed by the 4 main male characters. I will try to upload a completed character design at least once a day on days I am not working! Look forward to one of the characters being revealed today! 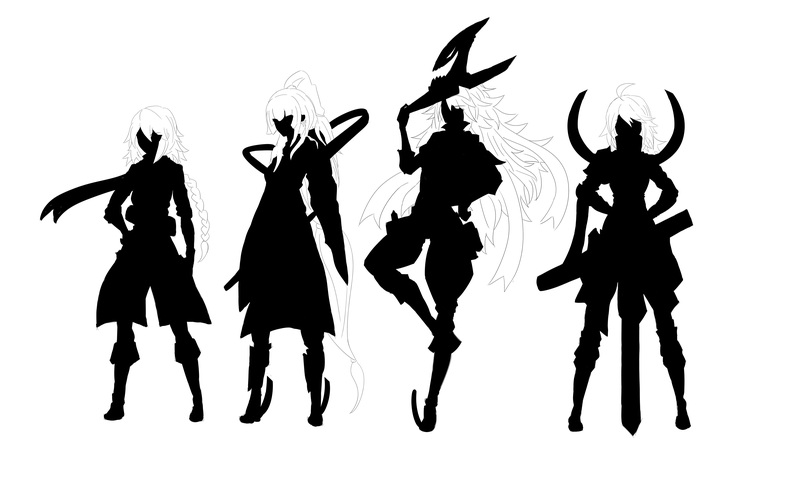 For now, have this teaser that showcases the character's silhouettes. 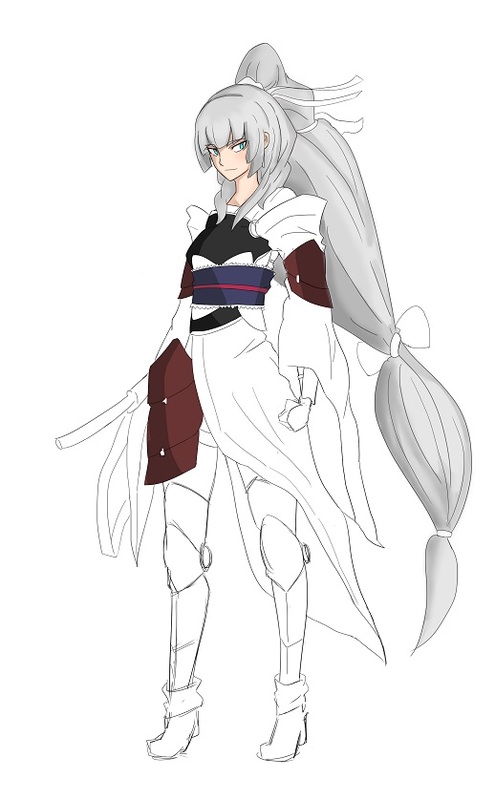 One of the characters you've already seen, she has been completely redesigned! Liking the silhouette approach! I find your style pleasing - that's probably my taste for shounen. Haha. :O you can draw AND program?! I'm so jealous T_T Programming is something I really want to learn but on my first attempt I had to learn that it won't come easy to me. I wish yoou best of luck with your big project and I'm looking forward to see what's coming!